How did the snow bear get its belly button? We still don't know for sure. 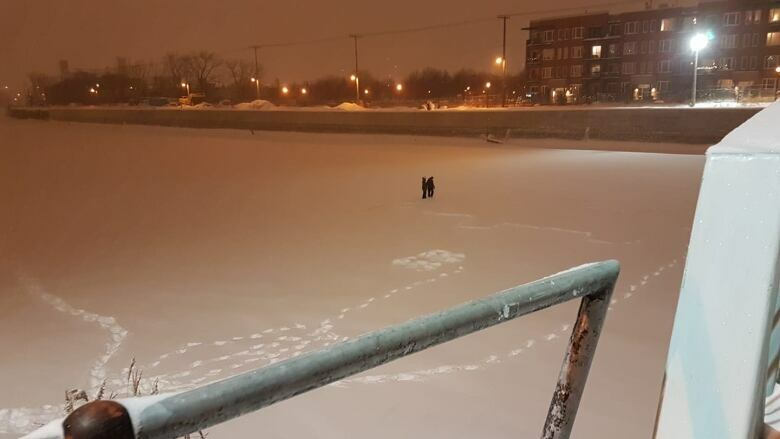 No one has taken credit for the drawing that was first noticed on Wednesday morning in the snow of Montreal's Lachine Canal, nor explained how it was done, considering the two-metre gap between the bear's outline and its belly button. Despite that, a clue has surfaced. On Thursday morning, CBC Montreal received a photo from neighbourhood resident Hamish Lloyd Lambert — taken around 10 p.m. ET on Tuesday, he said — that shows two people making the bear. Lambert said he does not know them. The picture doesn't explain how they made the belly button, but it gives some hints. The artists don't appear to have any tools. Of the hundreds of CBC readers who have raised theories about the bear, many speculated that its belly button was made by reaching with a stick or other object. We also know the temperature was as low as – 20 C when the bear was being made, possibly ruling out another of the main theories. Dozens suggested the belly button was made by a drone. That would be tough, says freelance journalist Tracey Lindeman, because drone batteries probably can't withstand such cold weather. "Most drone batteries can't last longer than a few minutes in those temperatures," she wrote on Twitter. 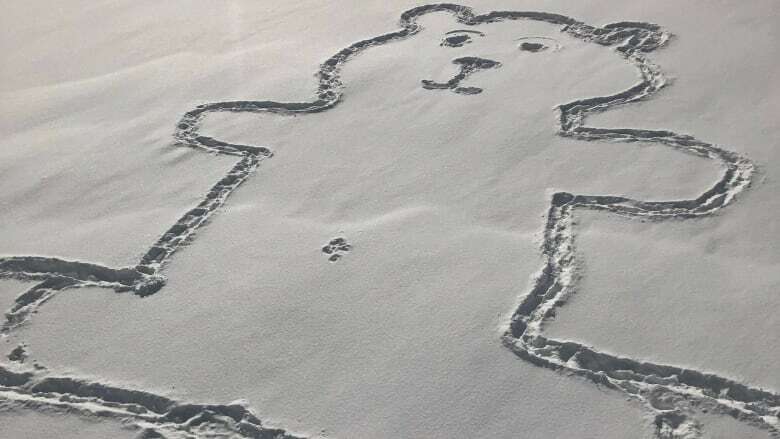 Help solve a mystery: How did this snow bear's creator make its belly button? The vast majority of theories — seen on social media, area blogs and elsewhere — involve some sort of long tool, like a hockey stick. "It's two people with a rope and a weight in the middle," wrote Andrew Zuliani. Quite a few readers said they would use fishing gear to make the belly button. Some suggested attaching a boot to the end of the rod. "I would've used a fishing rod," wrote Curt Hunter. Others suggested teamwork. Dozens of people suggested one person was on each side of the bear, and used a rope and boot to make the belly button. "Release tension — weight drops and leaves a mark — retension and weight rises with no trail," wrote Jeff Karau. 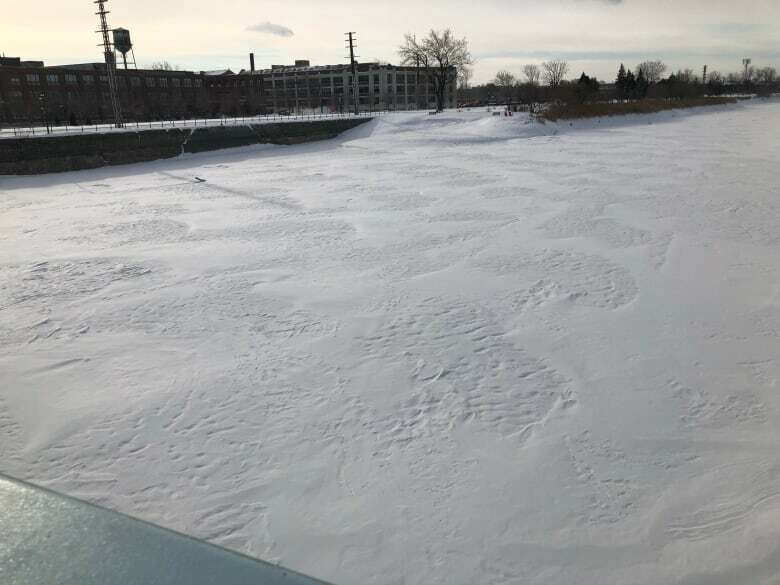 Walking on the canal is not allowed, according to a spokesperson. The Lachine Canal organization recommends going to La Mauricie National Park instead, where it's legal to walk on the ice.